If you like the look of Helen's charms but can't afford to splurge, Nashelle has a similar charm available at South Moon Under for $25 (available in gold only). Click here to purchase any letter of the alphabet (chain sold separately). Check out http://frenchietags.com/ they offer a similar style in silver, for less money and part of the money is donated to French Bulldog Rescue Network! 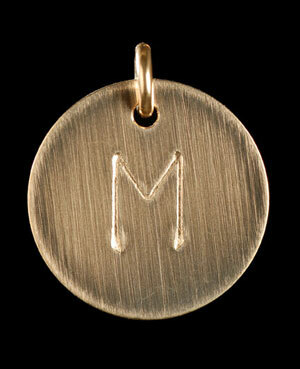 LOVE the M...thinking I need one to go with my new gold watch....and with my new MARRIED last name!!! How fun! But even better.... get a totally custom charm at jennypresent.com. Seriously, have you seen her stuff? It's gorgeous, and affordable for great quality. You can get silver like the Helen, or you can get different sizes, mixed metal, gold, etc. I have the Nashelle necklace and I loove it. I reblogged about it today. Great minds think alike!